The country expands its hydro storage plans as PV capacity soars. 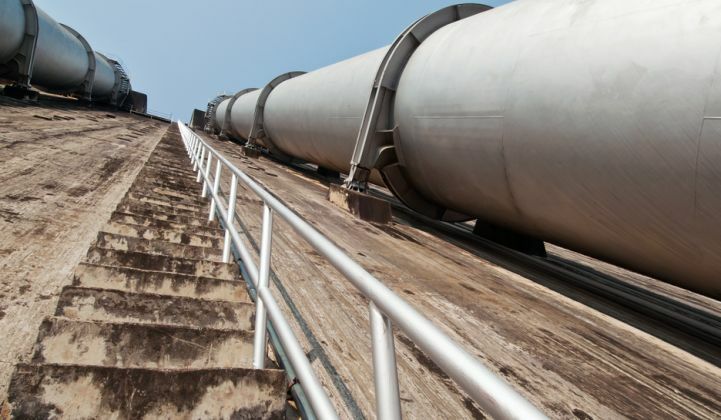 India is embarking on a plan to build out gigawatts of pumped hydro facilities to help store the massive levels of renewable energy it will be producing within a decade. S.D. Dubey, chairperson of India’s Central Electricity Authority, last month confirmed plans for 10 gigawatts of pumped hydro storage across the country. The plan will cost 80,000 crore rupees (about $17.2 billion) over the next five to six years according to The Economic Times. Dubey said pumped hydro storage costs could be a fraction of the cost of lithium-ion batteries. He said the capital costs of the plants would be between 6 and 8 crore rupees ($1.3 million and $1.7 million) per megawatt. This compares to a per-megawatt capital cost for solar projects between 5 and 6 crore rupees ($1.1 million and $1.3 million). India has a potential for up to 90 gigawatts of pumped hydro storage, said the report. Although supporting solar is a goal, Indian renewable energy analyst Madhavan Nampoothiri said the pumped hydro reserves would be a boon for the grid in general. “Considering a target of 175 gigawatts of renewables capacity by 2022, India will need to be ready with all technologies at its disposal to manage the grid, which will have to handle a progressively increasing quantum of intermittent solar and wind energy,” he said. Pumped hydro would be useful not just for storing excess renewable energy, he noted, but even thermal power produced during periods of solar or wind overload. “In addition to providing grid flexibility, these plants can use cheap off-peak power to pump up the water and generate power during peak hours, at higher rates,” he said. Brett Simon, energy storage analyst with GTM Research, said there were advantages and drawbacks to the pumped hydro concept. “Today, pumped hydro accounts for the bulk of deployed electrical energy storage capacity worldwide and is often cheaper than other forms of storage, such as batteries,” he commented. For now, it is unclear which locations are being studied for pumped hydro development by the Indian government, although a number of projects are already underway, and the concept has been alive in India since well before the current solar boom. One of the most significant pumped hydro storage projects currently underway is Sillahalla, a 7,000-crore-rupees ($1.5 billion), 2-gigawatt plant in the Nilgiris District of Tamil Nadu. The plant is being developed by the Tamil Nadu Generation and Distribution Corporation and involves construction of a dam across the Sillahalla River and a 2.75-kilometer tunnel connecting it to the existing Avalanche-Emerald reservoir. The dam is scheduled for completion in 2018 or 2019, while the rest of the project is due to start operation in 2022, according to news reports last year. A tender is currently open for laboratory tests on borehole core and bedrock samples at the site. Other pumped hydro projects known to be under consideration include the 1-gigawatt Turga project in West Bengal, the 600-megawatt Upper Indravati plant in Odisha, and a 450-megawatt development based around the existing Kundah hydro stations in Tamil Nadu. Storage is likely to become a pressing issue across the country as it moves forward with ambitious solar targets. According to GTM Research’s latest Global Solar Demand Monitor, India is set to have a cumulative PV demand of 46.1 gigawatts between 2016 and 2020. The soaring level of installations will take the country from its current eighth place worldwide in terms of PV demand to third globally in 2020.